Cardiff airport is easily accessible from England via the M4 and from further North in Wales by both private and public transport. 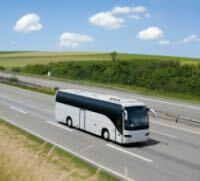 Explore the options below to find out which method of getting to Cardiff is best for you. You can often make big savings when you research which method of travel you would like to use and book your tickets online. Transport providers will often cut prices on early bookings, so it’s certainly worth sorting out all transport to and from Cardiff Airport in advance, saving you a lot of last minute hassle, too! National Express - Reach the whole of the UK! Travelling to Cardiff by car is a great option for most people as it’s so convenient! If you have your own car, there are plenty of afforadable airport parking options to choose from, as well as the option of booking a hotel the night before – many airport hotels even offer stay and park packages, where the cost of your parking is included in the price of your stay . This is a reasonably priced option and saves you the hassle of having to get up at the crack of dawn to travel for an early flight! Cardiff Airport is easily accessible by car from the M4 from England and from various A roads further North in Wales shown by the map on the left. You can find out much more about directions, and view interactive transportation and terminal maps by visiting our Cardiff Maps & Directions page. Cardiff Airport has excellent connections with key towns and cities across the country. The coach pick up and drop off points are situated in front of the terminal building. To get from Cardiff Coach Station to the Airport, you can catch a choice of buses as detailed below, or even book a taxi. The T9 Cardiff Airport Express Bus Service operates between Cardiff’s city centre and the airport. For just £5, travel in style with leather seats, WiFi, climate control and extra luggage space. You can also catch the 905 Bus Service from the train station for as little as £1 each way. Taxis are a great, hassle-free and convenient way to get to the airport. There are over 300 taxi companies serving Cardiff Airport and the surrounding areas, many of which specialise in airport taxis and can offer great rates. Find cheap airport taxis near you by checking out our Cardiff airport Taxi Listings. There is a rail link which connects Rhoose Cardiff International station with Cardiff Central and Bridgend. Trains run in each direction every hour and connections to stations around the country can be made from here Cardiff. Cardiff is served by regular, direct InterCity and Alphaline trains.